Thanks to the CSPI website for the link. DOONESBURY © 2005 G. B. Trudeau. Reprinted with permission of UNIVERSAL PRESS SYNDICATE. All rights reserved. CHICAGO—February 23, 2006—More than 25 million Americans—including nearly 9 million children and 3 million seniors—receive emergency food assistance each year from America's Second Harvest—The Nation’s Food Bank Network of charitable agencies, representing an 8 percent increase since 2001, according to a report released today. 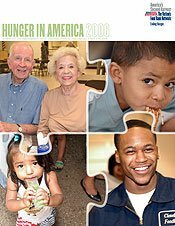 Hunger in America 2006, based on 52,000 face-to-face interviews with people seeking emergency food assistance and more than 30,000 agency surveys, is the largest, most-comprehensive study ever conducted on domestic hunger. The study was commissioned by the America's Second Harvest Network and sponsored by Altria. “It is tragic and alarming that more and more people are relying on emergency food assistance in the United States, where we produce enough food to feed every hungry person in the world,” said Robert Forney, President and CEO of the America's Second Harvest Network. The research for the report released this week was conducted by a leading consultancy on food assistance issues, Mathematica Policy Research, Inc., on behalf of America's Second Harvest, with financial support from Altria -- the parent company of Kraft foods and Philip Morris cigarettes. USDA's Food and Nutrition Service (FNS) recently published a contractor's astonishing design (.pdf) for a 17-year $41-million agenda of research to evaluate the Food Stamp Program's impact on hunger and dietary quality. After the first 12 years and $31-million investment in developing the nonexperimental research methodology, the contractor reported blandly, the project could not "guarantee that a reliable nonexperimental evaluation will be possible." So, at that point, all of the effort so far might have been fruitless. When I heard the contractor present this proposal at a USDA meeting this month, I expected the officials at FNS to sputter and guffaw at the implausible time line and budget (several times the total annual food assistance research budget at USDA). Instead, the FNS officials smiled and nodded and struck a pose of reasonable and deliberative skepticism. There had to be a backstory. Under the new banner "Expect More", the federal government's Office of Management and Budget (OMB) publishes controversial evaluations of federal government programs. These evaluations, which are sometimes ridiculed even by leading experts within OMB, are widely perceived as a political exercise to justify imminent White House proposals for program cuts. In the world of food assistance programs, the National School Lunch Program received the dreaded classification, "results not demonstrated." 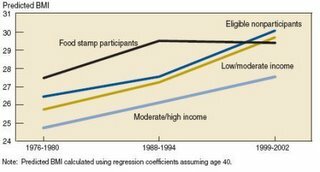 The larger Food Stamp Program fared much better, earning a classification from OMB of "moderately effective" -- this rating despite the fact that the program's goal is to reduce food insecurity and hunger, and federal statistics show the prevalence of these social ills have been increasing during every year of the current administration. When I first read the favorable rating of the Food Stamp Program on OMB's predecessor to the "Expect More" website a couple years ago, it occurred to me that the political folks in OMB may have been too cowardly to state the obvious: the current food assistance programs are not sufficient to halt the increase of hunger in America. Far from justifying program cuts to the popular Food Stamp Program, the confession of failure implied by an OMB rating of "results not demonstrated" might have convinced the American political establishment to strengthen these programs. Or worse (from the administration's perspective), if food stamps were declared officially ineffective, somebody might eventually have asked whether any program that merely distributes food benefits would suffice to stop the rise of hunger in an economic and political environment where increasing wealth for the few and deteriorating welfare for the many are accepted with complacency. Maybe hunger simply follows hopelessness as naturally in real life as it does in the dictionary. But back to my story.... I had missed reading the important small print in OMB's assessment of the Food Stamp Program. Cognizant of the statistical ironies in its evaluation, OMB instructed USDA's Food and Nutriton Service (FNS), which oversees federal food assistance programs, to develop new studies "to demonstrate the impact of program participation on hunger and dietary status." One imagines that OMB staff expected FNS to propose a scientific evaluation, perhaps with random assignment of program participants to several variants of the program, so that one could be sure the program parameters -- rather than confounding variables -- were responsible for the observed outcomes. However, it is almost a matter of religion at FNS that random assignment research designs are illegal or unethical (I doubt both points, while admitting that some such designs are illegal or unethical, and will continue to post on this topic in the future. I know that the same contractor has in the past articulated the logic in favor of serious random assignment research designs for such programs). FNS gave the task of developing a research agenda in response to a contractor, Abt Associates, with a long history of competent research on food assistance programs. FNS and a committee of outside experts both gave the contractor the self-contradictory instructions that it could not rely on random assignment research design, and yet it had to take the problem of confounding variables in nonexperimental research very seriously. Only in this light can you see how the contractor could see its resulting proposal as reasonable. If random assignment is off the table, and yet the nonexperimental research design must solve the tough challenge that random assignment solves, one would have to first spend an immense effort -- 12 years and $31 million, as it turns out -- just to make sure the nonexperimental approach works properly. See the figure below for an illustration of the research plan's many individual studies. So, that explains the contractor's astonishing proposal, but what explains the cheerful response from the FNS officials who requested the report? None of the FNS officials said it explicitly, but I doubt a single one of them believes this research plan will be implemented. There may have been two reasons they liked the report. First, everybody praised the report for laying out the research issues clearly and honestly. Second, the report may have served a rhetorical purpose in FNS' dealings with OMB. By publishing the report on the FNS website, they are saying to OMB: "You want a study of the impact of food stamps? Here you go. Let us spend $41 million chasing this one down, and we'll give you the answer in 17 years. Then, if the results are unfavorable, we can start discussing program cuts at that time." In response to earlier posts on children's music with nutrition themes, the comments have some fine additions. Barbara from Tigers and Strawberries and the new Paper Palate (part of the Well Fed network) suggests "On Top of Spaghetti" and, from the old Schoolhouse Rock, "Hanker for a Hunk of Cheese." Devont, the children's music weblogger (yes there does exist a specialist children's music weblogger) offers his favorite quote from Timer, the wedge of cheese in the Schoolhouse Rock piece. 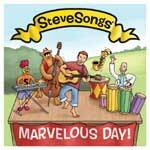 A student writes to recommend Dr. Carl Winter's food safety music site. The web page claims he is a "serious toxicologist," but we suspect he actually has a bit of a silly streak. In modern-day America, it’s obesity, not starvation, that is harming kids and killing people who should be in their prime. But food stamps are still buying soda pop, potato chips and deep-fried frozen dinners — and according to cashiers, buying them in droves (the U.S. government can’t be bothered to track purchases). It’s the all-American irony: Our land of riches is killing us, especially our poorest and most vulnerable. That’s why it’s time to put some strings on this entitlement, which, in Indiana, has shot up 85 percent in the last five years alone. In the most interesting sections of the column, however, Holmes gives her main thesis a second thought. It’s a taboo topic. Politicians and decent folk duck it like the plague. There’s an ugly tone about the question, that conjures up the sentiment: I can have my cake, but you can’t eat yours, too. Yet what’s wrong with limiting junk food to 10 percent of benefits? Why not reserve 15 percent for fresh fruits and vegetables? Why not say we want our billions to go to building healthy bodies and strong brains, not diabetes, cancer and heart disease? My friend Aletha, who often uses food stamps to get by, argues it’s cruel and un-American to single out the poor for the nutritional police. “Nobody ever listens to that darn food pyramid,” she argues. She’s making efforts — weaning herself from the cheap, empty calories so appealing in the freezer case when her benefits come in. But that’s her choice to make, not mine, she argues. I fear I may be one of the "polititians and decent folk" Holmes has in mind. What bad company those decent folk keep! Tracy Jan writes about candy in school in today's Boston Globe. The article (in the news section) makes the case against banning candy sales in schools, on grounds that kids will bring their own candy in. The headline is: "A sweet tooth is tough to pull -- Even when schools ban candy machines, pupils indulge." Rhetorically, the article sets the candy sales bans up for failure by comparing them to an unrealistic goal -- the ability to "control" all of what students eat. Like Mildred Avenue in Dorchester, dozens of schools across the Bay State -- including some in Natick, Framingham, Billerica, and Marlborough -- offer vending machines stocked exclusively with healthy choices. But a lunchtime visit to Mildred Avenue yesterday showed that school officials and lawmakers cannot control what students eat by changing what is sold in vending machines. Children bring candy and other snacks from home or buy them on their way to school. And they don't think the proposed law would change their eating habits. I think any sensible advocate for candy sales bans would say the goals are to reduce the ubiquitous presence of candy sales, and to end the hypocrisy of having adults in school preach good nutrition and at the same time make money selling candy to the kids, all during an epidemic of childhood obesity. The candy sales bans look to me like great policy, by those more realistic standards. Jan's next paragraph makes things worse by quoting, without rebuttal, a student's justification for preferring to keep candy sales in school. 'Sometimes, we have headaches and we need sugar in our heads," said Yarmisha Cofield, a Mildred Avenue seventh-grader who ate the $1.29 tube of sour candy and only picked at her school lunch of fried chicken. In terms of policy, the article makes a fairly toothless "compromise" bill under consideration today in the Massachusetts Senate look good by comparison to the stronger bill under consideration in the House. Most nutritionists would consider the sports drinks that are permitted under the Senate bill to be little better than the caloric sodas the bill prohibits. NAS releases report on food security and hunger measurement. The Committee on National Statistics (CNSTAT), part of the National Academies, today issued its long-awaited report on U.S. food security and hunger measurement. Responding in part to concerns raised by staff at the Office of Management and Budget (OMB), the report criticized the use of the term "hunger" as the severe range of the scale of hardship that the federal government describes with the term "food insecurity." The panel therefore concludes that hunger is a concept distinct from food insecurity, which is an indicator of and possible consequence of food insecurity, that can be useful in characterizing severity of food insecurity. Hunger itself is an important concept that should be measured at the individual level distinct from, but in the context of, food insecurity.... The panel urges USDA to consider alternate labels to convey the severity of food insecurity without the problems inherent in the current labels. Currently, the federal food security survey asks 18 questions about symptoms of food-related hardship and, on the basis of the number of affirmative responses, classifies households as "food secure," "food insecure without hunger," and "food insecure with hunger." 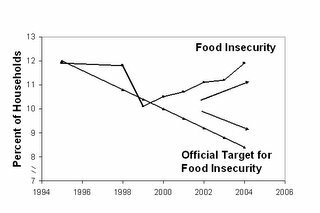 The food security statistics are heavily used in government to evaluate the success of anti-hunger programs (one might better say the limited success, given that the rate of household food insecurity has been rising for several years). The report points out that the term "hunger" is particularly "evocative" and politically potent. If, as seems possible, the report's recommendations cause a halt for several years in federal efforts to measure how many Americans are "hungry," it will be a significant disappointment to anti-hunger advocates. That, in turn, would remove one of the main constituencies that has supported the fairly expensive survey collection effort. The report also addresses a number of technical issues. It recommended increasing the attention to the "frequency" of specific hardships -- measuring not just whether anybody in the household skipped meals during the year, for example, but how frequently that symptom of hardship occurred. At the same time, the report recommended investigating a more complicated family of statistical models to take account of the new focus on frequency issues. While taking account of frequency of occurrence is a great idea, I believe this latter recommendation would reduce the transparency of the survey results and hinder their use for important communication and public policy purposes. For example, with these models, it will no longer be possible to classify households as "food secure" or "food insecure with hunger" by simply counting up the number of affirmative responses to 18 survey questions. Also, the proposed family of models relies on more severe statistical assumptions than those that are required for the current approach. Nobody needs an "Item Response Theory (IRT)" model to measure unemployment or poverty, and it is not clear to me that ever more arcane members of this family of models will contribute to clear policy-relevant information about food security and hunger either. Speaking of policy-relevance, the report recommended that USDA stop using the rate of food security and hunger as way of measuring the success of anti-hunger programs, under the provisions of a law known as the "Government Performance and Results Act (GPRA)." This recommendation also entails a loss. The GPRA act specifically asks federal agencies to evaluate the success of their programs using genuine outcome measures (like reducing hunger) rather than process measures (like delivering a certain number of free meals). Furthermore, I am not sure this recommendation is based on clear reasoning. It is quite correct that factors other than government programs also influence food insecurity and hunger, and yet rates of food insecurity and hunger may still provide useful information about the success or failure of major national anti-hunger and anti-poverty programs over time. I suppose my conclusions run quite contrary to the broad themes of this report. To provide good information about the hunger problem in America, and to facilitate continued improvements in anti-hunger programs, future changes to the food security and hunger measure should aim for ever-greater simplicity, transparency, and policy-relevance. Feb. 7 -- The U.S. Department of Agriculture has conducted extensive research on hunger and food insecurity in America, but the department needs to improve how this work is carried out to better inform policymakers and the public, says a new report from the National Research Council. The link on the front page of the NAS website currently runs to the earlier phase I report released last year (and discussed here and here). At the request of the panel that produced that report, I presented a paper about how the federal food security measure is actually used (.pdf). I imagine the new press announcement means the new report will be released very soon, and the headline seems to imply that the new report is critical of current practice. The advice from North Dakota: "Give the customers what they want." [North Dakota] Agriculture Commissioner Roger Johnson is urging the federal government to rethink its strategy for regaining the market for U.S. beef in Japan. 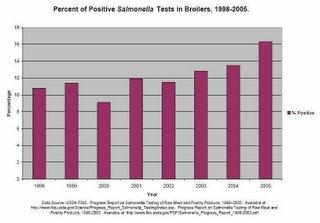 "I have asked U.S. Secretary of Agriculture Mike Johanns to let U.S. packers voluntarily test all beef they export to Japan for bovine spongiform encephalopathy (BSE)," Johnson said Friday. "Our best hope for regaining our beef markets in Japan is to give the customers what they want." Johnson said U.S. policy has failed because USDA has treated the matter as a public health issue, not a marketing issue. "USDA's approach of continually browbeating the Japanese government into taking a product which is viewed with suspicion by the Japanese consumers has now resulted in even further erosion of Japanese consumer confidence in U.S. beef," Johnson told Johanns. "Let's give our customers what they want. That has always been the key to success in any business." Last fall, when USDA published its annual estimates for the prevalence of household food insecurity -- 11.9 % of all U.S. households -- it seemed important to provide a bit more context. After all, who knows what that number means on its own? 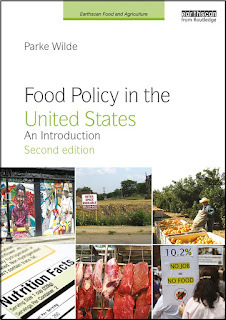 So, a post on U.S. Food Policy and a press release from the Friedman School at Tufts offered some additional perspective. The new prevalence estimate represented the fifth straight year of worsening food security, and it tied for the worst prevalence estimate reported since the modern national data collection began in 1995 (see graphic below). Food insecurity is the term used to describe households where not all members have access to enough food for an active, healthy life at all times. 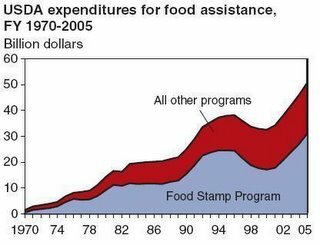 The US government’s main strategy for dealing with it is the food stamp program; in 2005 an estimated average of 25.6 million households received food stamps each month. Dr Parke Wilde, assistant professor at Tuft University's Friedman School of Nutrition Science and Policy, told NutraIngredients-USA.com that it is fair to say there is a connection between food insecurity and nutrition problems. Paradoxically, in food insecure families there is a higher incidence of overweight and obesity. Wilde said this may be due to a ‘boom and bust cycle’ caused by sporadic access to sufficient food. Food stamps are credited on a monthly basis, and the typical pattern is that recipients make a large shopping trip at that time. The publication comes from a company called NutraIngredients, and its reporter added some quotes from supplement industry f0lks at the bottom of the article. Still, the article did well to make clear to readers that the pro-supplement material was their own addition, not my view. While Dr Wilde said his colleagues maintain that the emphasis on nutritional advice should be on food rather than supplements, [supplement industry figure Steve] Mister emphasizes that they are called “dietary supplements, not dietary substitutes”. The article mentioned my very real concern about food insecurity in the last week of the monthly food stamp cycle, but it wisely avoided blaming the Food Stamp Program too broadly and provided a balanced summary of some of the merits and demerits of possible program changes. So, no complainst about NutraIngredients today (I'll have to explore the site more critically another time). Unfortunately, like the children's game "telephone" gone awry, another odd industry publication call AMonline.com in turn picked up the NutraIngredients article and ran with the headline, "Nutrition Professor Claims Food Stamp Program Results in Nutrition Problems." That's not right. Most readers will assume the "nutrition professor" -- really, an economist in a nutrition school -- is a conservative program critic. It seemed so clear in the NutraIngredients article that I am concerned about the food stamp cycle, but read with sympathy both the proponents and opponents of some suggested program changes. Both I and my school's public relations folks contacted the online publication, asking them to correct the headline. My online comment runs at the bottom of the wayward article, and the evidence that the headline overstates is contained right within the article itself. Why would they leave up both the headline and the critical comment? In their shoes, wouldn't you change the headline? It is not directly related to food policy, but you may appreciate this AIDS-awareness advertisement from Médécins Sans Frontières (MSF-Belgium). My five-year-old began kindergarten at our local public school this fall. Having your oldest child leave home for school feels like taking the most precious thing you have and setting it on a post in a very public place, with a poster underneath saying, "Here you go world. Have at him." While most children in our elementary school appear to bring lunch, there is a substantial fraction who participate in the National School Lunch Program. Our boy gets his lunch every day from this program. There may be no stranger world, in all the literature of science fiction and fantasy, than the world of kindergarten as a parent hears it described by a five-year-old. I know, for example, that the federal school lunch program has requirements that children at least be offered a meal that meets the federal Dietary Guidelines. Still, the menus we get from the school are full of fast food main dishes like chicken nuggets and stuffed crust pizza. Our son sometimes reports eating carrots or fruit salad, but at other times it seems there was no fruit or vegetable. When asked, he agrees that there apparently was some such thing somewhere, but it leaves me picturing a bowl of vegetables in a small cave at the end of some long rabbit hole in Alice's Wonderland. I spoke of these experiences a couple weeks ago as panelist at the annual public forum of the Arlington, MA, chapter of Stand for Children, a national network of local chapters that advocate for public policies to serve the interests of children. This year, the priorities for our chapter are to ensure adequate education funding at the state level, and to promote a strong local school wellness policy. All school districts must establish such a wellness policy by the start of the 2006-2007 school year. An earlier post linked to one source of model planks for such a policy, from the Center for Ecoliteracy. I have since found others. See, for example, the website of Action for Health Kids. The effect of school nutrition policies is a very active area of current research. A December article by Martha Kubik, Leslie Lytle, and Mary Story in the Archives of Pediatric and Adolescent Medicine is a good place to start. In addition to concluding that lax policies are associated with increased childhood obesity rates, the bibliography is helpful for readers who want to compile some of this research for use in their own wellness policy advocacy in the next couple months. But it takes more than research. An article by Anne Wallace Allen in the Associated Press yesterday, about junk food in an Idaho school, makes clear how important it is to pay attention to building an advocacy coalition in support of some of the stronger planks. In the Idaho school, for example, the Parent Teacher Organization (PTO) was a major opponent of strong nutrition policies, out of concern for the implicit paternalism and perhaps out of concern for the loss of its own junk food fundraising sources. Other potential sources of opposition include school food service directors who must balance a tight program budget using sales of a la carte items and perhaps vending machines, or principals whose discretionary budget relies on vending machines. Student groups, also concerned about puritanical nutrition policies, might be another source of opposition. I think each of these concerns can be addressed with some patience and understanding. Here in Arlington, I hope we can begin outreach to groups that use unhealthy food in fundraisers early. Many of these groups have probably always thought of their fundraisers as harmless, and perhaps rightly so when everybody else is selling junk food in schools also. What makes the new wellness policy different is that it hopes to establish a better environment in which adults in school aren't making money selling junk food to children. In this new environment, the occasional fundraiser does comparatively more damage to the overall message about what a healthy school day is like. I think most sponsors of fundraisers, who are after all raising money to help these same children, may be willing to take into account these changes. For outreach to student groups, I have two ideas. One is to meet with student leaders to discuss how much of the junk food marketing in schools is intended to manipulate them and their colleagues. While students may be concerned about puritanical nutritionists, these nerdy do-gooders can't hold a candle to the more sinister mind control games of the junk food marketers. I think the fabulous youth-centered anti-tobacco ads a few years ago, which effectively skewered the implicit lies in tobacco marketing, did wonders for making non-smoking cooler. The second idea is to try to get help from coaches and athletes, who have a more immediate interest in a healthier nutrition and fitness environment in schools. While reducing heart disease at age 70 may not be an effective motivator for teenagers, it is far from the only selling point for a strong school wellness policy. Please feel free to post comments with suggested resources and the experience of your own school district. And wish us luck here in Arlington this Spring.